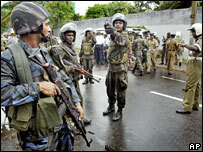 At least seven people have been killed and 17 injured in a explosion in the Sri Lankan capital, Colombo. A powerful mine exploded near the official residence of President Mahinda Rajapakse as a convoy, including a Pakistani embassy vehicle, went past. The Pakistani ambassador, Bashir Wali Mohamed, was travelling in the convoy but was unhurt in the incident. A Pakistani official said Mr Mohamed was returning from a flag-raising ceremony for Pakistan's Independence Day when the explosion happened. The blast shook the windows of neighbouring buildings and damaged an embassy vehicle, reports said. The blast came after the Tamil Tigers accused government forces of bombing an orphanage, killing 43 school girls and injuring 60 in the rebel-controlled northern district of Mullaituvu. The military said there had been air raids, but denied any knowledge of the alleged incident. The government has also denied rebel accusations that its forces killed at least 15 people in an attack on a church in the predominantly Tamil village of Allaipidddy on an island just west of Jaffna. The recent flare-up in fighting has alarmed Sri Lanka's key foreign donors - the US, Japan, the European Union and Norway - who have called for an immediate end to the hostilities, which they said was "seriously unravelling" the 2002 ceasefire agreement. They also expressed serious concern about the humanitarian situation.